A cataract is a clouding that develops in the crystalline lens of the eye or in its envelope, varying in degree from slight to complete opacity and obstructing the passage of light. Early in the development of age-related cataract, the power of the lens may be increased, causing near-sightedness (myopia), and the gradual yellowing and opacification of the lens may reduce the perception of blue colors. 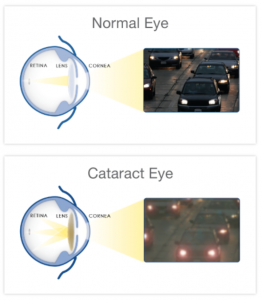 Cataracts typically progress slowly to cause vision loss, and are potentially blinding if untreated. The condition usually affects both eyes, but almost always one eye is affected earlier, and more severely, than the other. Occurring in the elderly, a senile cataract is characterized by an initial opacity in the lens, subsequent swelling of the lens and finally shrinkage with complete loss of transparency. With time, the cataract cortex liquefies to form a milky white fluid in a Morgagnian cataract, which can cause severe inflammation if the lens capsule ruptures and leaks. Untreated, this type of cataract can cause phacomorphic glaucoma. Advanced cataracts can become dislocated to the front or back of the eye. In ancient times, some spontaneous posterior dislocations were regarded as a blessing from the heavens, because some perception of light was restored in cataract patients. Cataracts can sometimes form after an eye surgery for other vision problems such as glaucoma. Cataracts may also develop as a side effect of other health problems such as diabetes. Secondary cataracts have been linked to steroid use and other risky behaviors. Cataracts can develop after an eye injury, sometimes years later. Accidents and injuries early in life may manifest themselves as cataracts as the individual grows older. Some babies are born with cataracts or develop them in childhood, often in both eyes. These cataracts may be so small that they do not affect vision. If they do affect the vision, the lenses may need to be removed. Children may develop congenital cataracts before or just after birth but these are usually dealt with very differently from cataracts in adults. Cataracts can develop after exposure to some types of radiation including x-rays and gamma radiation. Radiation causes a variety of health issues in addition to the increased risk of cataracts.